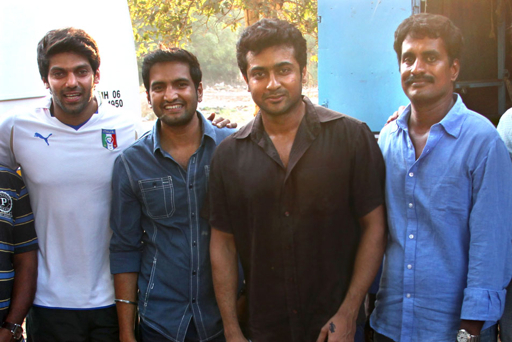 Surya, who is currently busy wrapping up shooting for his upcoming flick Maatran at Binny Mills near airport made a surprise visit to the adjoining sets of Settai (Tamil remake of Delhi Belly) recently. Everyone including its lead hero Arya, Santhanam, director Kannan and producer Dhananjeyan were pleasantly surprised by Surya’s gesture. Says Dhananjeyan, “When he came to know that Settai’s shootingwas going on in the next floor, he wanted to say hi to all. He enquired about the progress of the project and complimented that we were working at a rapid speed. 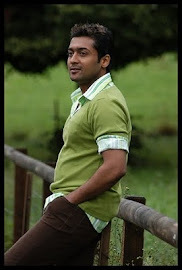 That was really nice of him.” It is reported that later on, Surya gave the entire unit a tour of the Maatran sets. Surya & Jyothika @ Abbas Birthday Party!